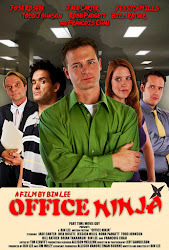 Office Ninja: Office Ninja is an Accolade Competition Winner! Office Ninja is an Accolade Competition Winner! Office Ninja has won a prestigious Award of Merit from The Accolade Competition. The Accolade recognizes film, television, videography and new media professionals who demonstrate exceptional achievement in craft and creativity, and those who produce standout entertainment or contribute to profound social change. Entries are judged by highly qualified professionals in the film and television industry. Information about The Accolade and a list of recent winners can be found at Accolade 2012 Feb Winners. In winning an Accolade, Part Time Movie Guy joins the ranks of other high-profile winners of this internationally respected award. Thomas Baker, Ph.D., who chairs The Accolade, had this to say about the latest winners, "The Accolade is not an easy award to win. Entries are received from around the world. The Accolade helps set the standard for craft and creativity. The judges were pleased with the exceptionally high quality of entries. The goal of The Accolade is to help winners achieve the recognition they deserve." On behalf of my cast and crew, I am honored to win this prestigious award. We had a blast making this feature, and I'm grateful for The Accolade to acknowledge the hard work, amazing talent, and hilarious creativity of these wonderful professionals on screen and behind the camera.